CELEBRATING A WEDDING AT ST. THERESE CHURCH: The Archdiocese of Los Angeles requires couples desiring to be married in the Church to begin their wedding preparation at least six months prior to the desired wedding date. WEDDING APPLICATION: To begin your wedding preparation, the FIRST thing to do is to fill out an Application to Celebrate a Wedding at St. Therese Church (click here (x) to access from this website or come to the Parish Offices to fill one out). If you obtain if from the website, you may save it in your computer and then upload it and submit it via email to the Parish Secretary, Denise McMaster, at denisekay@hotmail.com, OR you may drop it off or mail it to the offices (510 North El Molino Street, Alhambra CA 91801). The application will then be given to the Pastor, who will contact you to set up an initial appointment. He will give you all the basic information you need. The next step is to coordinate a time to meet with the Pastor, Fr. Philip, or the Associate Pastor, Fr. Matthias). For a Mass in Latin, contact Fr. Robert Bishop directly at (310) 631-5981, ext. 45. Copies of Sacramental Certificates: The Catholic party(ies) will be asked to obtain a recent certificate of Baptism (NOT the original but a copy dated within the last six months) for the purpose of proving freedom to marry in the Church). It should have a notation on the back showing that you received the Sacrament of Confirmation. If not, you will need to obtain a copy from the church where you received Confirmation. Freedom to Marry Form: Each party will also need two persons from his or her family (preferably parents) to fill out a "Freedom to Marry" form, attesting to the fact that the party seeking marriage has, to his or her family's knowledge, never been married and is choosing to freely and forever enter into the marriage. To download the FREEDOM TO MARRY form, click here (X). A full weekend through the Engaged Encounter Program offered by the Archdiocese. More information about the Engaged Encounter Weekend can be found by clicking here X. NATURAL FAMILY PLANNING: St. Therese Church also requres each couple to attend a Natural Family Planning Class offered at our church, followed by individual training sessions. The NFP classes are offered once a month; the couple should attend the class at least three months before the wedding. WEDDING TIMES: The wedding times you can choose from are Saturdays at 10:00 a.m., Noon, or 2:00 p.m. 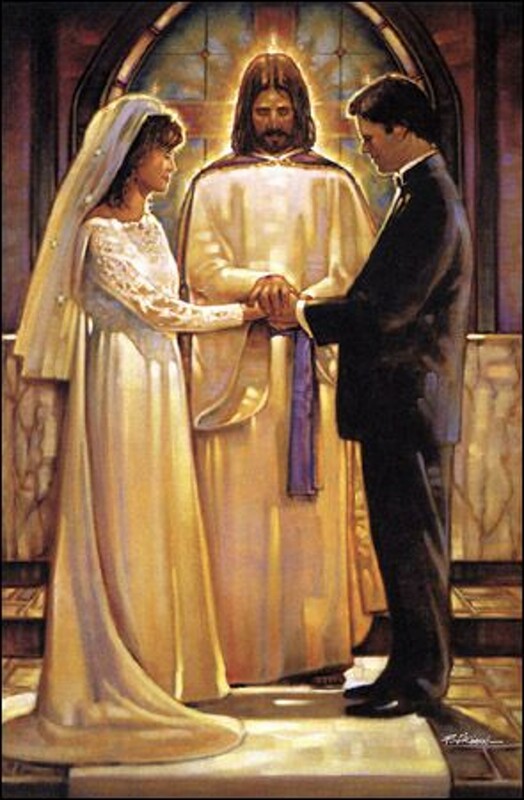 READINGS FOR THE WEDDING MASS: Couples are encouraged to choose the readings for the wedding Mass in order to make it more personal. A copy of the booklet, TOGETHER FOR LIFE, may be picked up from the St. Therese Church offices (it contains a form in the back to enter your selections). OR you may choose your readings by accessing a website (click here X to open it) which has links you click on to take you to the readings at www.foryourmarriage.org, a website which is an initiative of the U.S. Conference of Catholic Bishops. Click here X for a form on which to enter your selections for the readings and the readers. At the bottom of the home page of www.catholicweddinghelp.com you will also find a section titled FOR MORE INFORMATION, which includes a helpful link about choosing your lectors (those who will read the Scripture readings). CREATING THE PROGRAM FOR YOUR WEDDING MASS: For help in creating a program for your wedding, click here X. The program is a great way to increase participation by the congregation. (English Mass): Submit the wedding fee ($1,350) to the office at the time the wedding date is scheduled with the priest. This amount includes the fees for the use of the church ($500), the church organist ($250) and church cantor ($200), the liturgy planner ($200), the NFP Coordinator ($100), and the honorarium for the celebrating priest ($100). It does not include the honorarium of $10 each for the two altar servers ($20 total), which should be given to the servers at the wedding (in cash). (Latin Mass): Submit the wedding fee ($1,650) to the office at the time the wedding date is scheduled. This amount includes the fees for the use of the church ($500), the sacristan, who will purchase the necessary Latin Mass supplies ($100), the church organist ($250), the cantor ($200), the liturgy planner ($200), the NFP Coordinator ($100), and the honorarium for the celebrating priest ($300). This amount does not include the honorarium of $25 to each of the altar servers (either two or four, depending upon if your celebration includes a High Mass). Please arrange to have someone give this amount to each of the altar servers (in cash). Please note that flowers are not included in the fees. Wedding LITURGY Planner: After your have met with the priest and he has approved you to be married, then it is time to contact our Liturgy Planner (we have not replaced the previous wedding coordinator, but in the meantime, please contact Rhonda Storey at rhondalstorey@gmail.com). She will meet with you to discuss all the details of your ceremony and will be there to facilitate your wedding rehearsal. She will also be present at your wedding to make sure everything is on schedule. Music: Please contact our Music Director, Charlotte Lansberg, at cjlansberg@choochoorecords.com to arrange for the organist and cantor (no recorded music allowed). Natural Family Planning: Please contact the coordinator, Katrina Crow, at (626) 292-1906.